The City of Bowling Green will be hosting the 2018 Christmas Open House on Friday, December 7, from 3:30 p.m. to 5:30 p.m. in the Commission Chambers at City Hall. The holiday event is open to the public and allows the residents of Bowling Green to meet with elected officials and City employees. In addition to visiting with staff, be sure to pick up a copy of our 2018/2019 Calendar and Annual Report. Each year, the City releases a 12-month calendar that features pictures of Bowling Green with a theme. This year will highlight the “We are Bowling Green” photo contest winners and participants. Along with beautiful photography comes information on our budget, past projects, future ideas and general information of what government has done for you over the past year. After you have toured City Hall, grabbed a bite to eat, ridden in a horse drawn carriage, and picked up your holiday gifts, make sure to head down to Fountain Square Park where we will be partnering with The District and Downtown Merchants to officially light the Square! 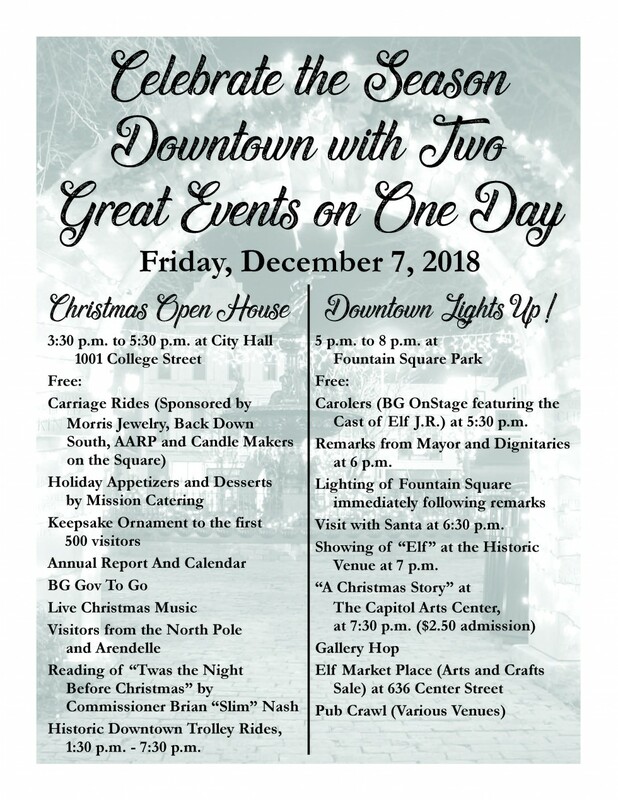 Downtown Lights Up begins at 5 p.m. and the lighting will take place immediately following remarks from elected officials at 6 p.m.
City Hall is located at 1001 College Street.